A superb day for sailing as you can see from the photo. 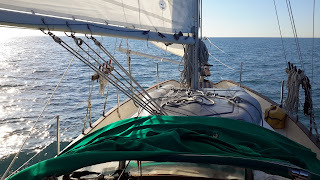 The breeze is out of the west at about 8 knots and so I am reaching along at about 4 gentle knots. I was up at 4am this morning to catch the wind shift and tide out of Port Canaveral. 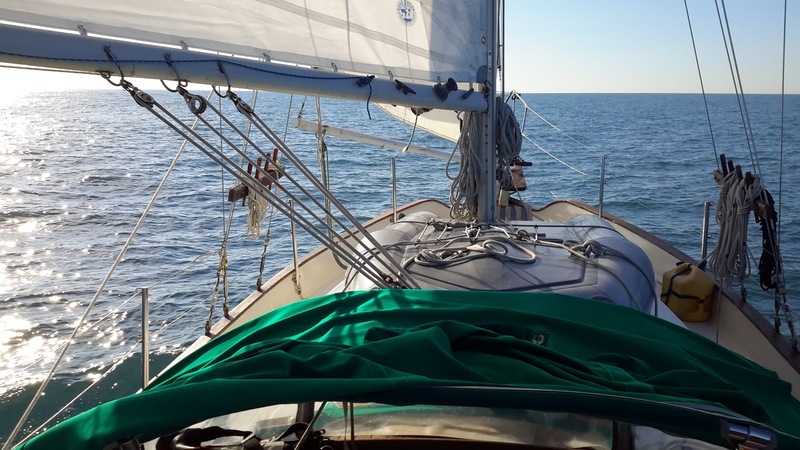 I had a bit of a dilemma earlier when my Genoa halyard got caught in the mast steps and I had to climb the mast while underway. I have climbed up the mast plenty of times at a marina but only a few times while underway and it is not something that I like to do, especially when there is no one around. I did take my VHF radio up with me in a backpack just in case I got stuck. Anyway it all turned out ok. The wind is supposed to die down this afternoon and then pick up again later on this afternoon to carry me southward all the way to the keys. Unlike my trip down from North Carolina, this trip will be close to shore so that I stay out of the north flowing gulf stream. As a result, I should have Internet coverage all the way and be not only able to check the weather closely but also be able to post to my blog.